Prof P.k. 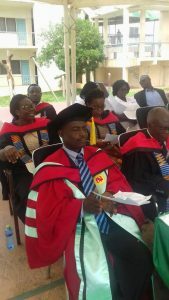 Basuah a lecturer from university of Cape coast was the special guest of honour on the maiden matriculation ceremony for the ENT top up students for the 2018/2019 academic year. Prof. on his brief address to the Top up matriculants said he was very happy nurses are now recognising the value of an academic certificate. But quickly added that they should not forget their value as nurses too. "The patient should always be a centre of priority during your service delivery ". He furthered on to say that; "you are already in the system and you know what your patients needs. Let this top up shapen you to do more for the betterment of the patient when you go back to your various hospitals"
Prof. Basuah ended his message by adding that the university of Cape coast is ready to offer any kind of service that the ENT school needs and the school should not hesitate to call for assistance. ©2017 ENT. All rights reserved.